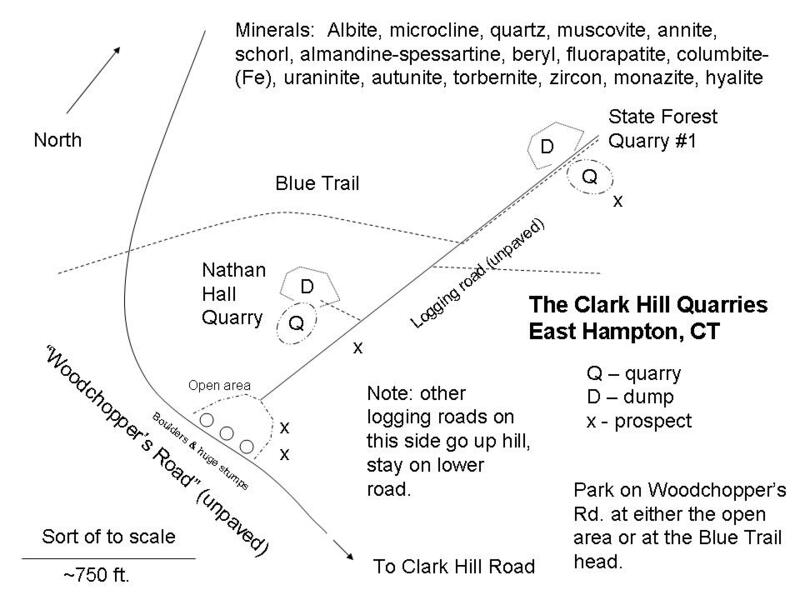 The Clark Hill Quarries are located in the Meshomasic State Forest off of Woodcutter's Road. Look for the State Forest Entrance sign on Clark Hill Road, East Hampton. Collecting is allowed by STATE PERMIT ONLY! Based on my experience, these quarries (State Forest Quarry #1 and the Nathan Hall Quarry) are quite productive! They have produced two of my best self-collected pieces and many other fine examples of simple pegmatite minerals. In particular, sharp muscovite crystals are very common at the Hall Quarry and the large, dark almandine garnets from there, although fairly rare, are awesome. I tested 7 garnets from Nathan Hall and 1 from SFQ#1 using x-ray fluorescence to determine the metal content and all 8 proved to be almandine, though rather impure with the iron content ranging from 77 to 53% relative to total Fe and Mn content. The black stain results from the Mn content but there is not enough Mn to call the garnets spessartine. Annite (fka biotite) is also common, mostly in bladed crystals up to several feet long. Beryl is uncommon, but crystals can be large, gemmy, and terminated and vary in color from yellow through green to aqua. Zircon, uranium minerals (beautiful autunite and torbernite halos around altered uraninite), and fluorapatite are sprinkled throughout. Albite is abundant; sheaf-like crystal aggregates with muscovite are found on pocket wall fragments at SFQ#1. Microcline occurs as small pocket crystals (SFQ#1) or in very large matrix crystals. Unfortunately much schorl tourmaline has altered to muscovite, but there are interesting tapered pseudomorphs similar to those from Wentworth, NH. Very nice pocket smoky quartz has been found at SFQ#1 and massive quartz, which encloses the sharp micas and matrix microclines, is very abundant at Hall, but good crystals there are usually pocket micros. Although tiny columbites are common, large ones are very rare and when you find one, you will remember every part of the experience! These quarries are full of surprises for the persistent collector. More recently, another pegmatite near the intersection of Woodchopper's Road and the logging road that leads to the quarries was uncovered by logging activity and the core zone has been prospected, yielding many beryls and some good garnets and columbites. Based on the few references, the Hall Quarry appears to have operated completely before 1922 (see below). There is nothing specific in the mineralogical literature, but presumably it was quarried for feldspar and/or mica. The F. W. Beers County Atlas of Middlesex, Connecticut, published in 1874, shows a large rectangle of land north of Clark Hill Road owned by "N. Hall". The Hall Cemetery is on Clark Hill Road near the entrance to Woodchopper's Road. I have found remnants of an old, late 19th century chewing tobacco hip pocket can, but also more recent artifacts like a corroded Gablinger's beer can (the first lite beer!) and a Cott soda bottle. SFQ#1 was quarried for mica and feldspar for only a few months in 1942 and 1943. Presumably the low muscovite mica content (see below) and high annite mica content in the graphic granite, which is abundant in the dumps and is typically shipped for ceramics, make this deposit uneconomic. Even a small amount of iron-rich minerals in the feldspar results in brown staining of the ceramic glaze. 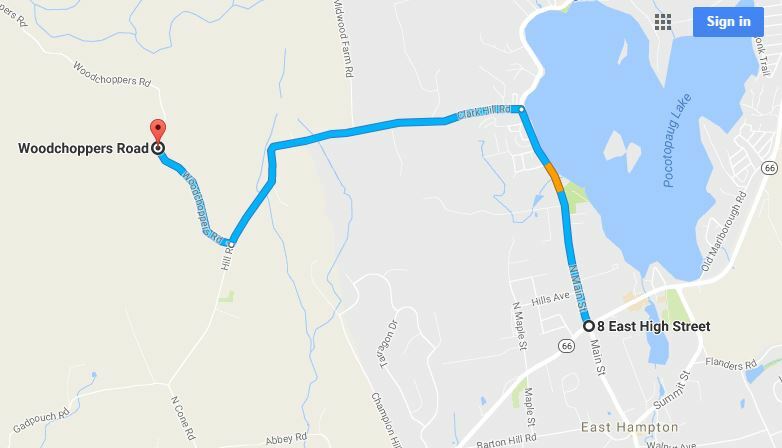 Note: These quarries should not be confused with State Forest Quarry #2, which is located along Mine Brook SW of the cobalt mines. SFQ#2 is the locality for many rare phosphate minerals similar to those found at the Palermo Mine in North Groton, NH.